I wanted to share with you a reblog, which happens to be my very first guest blog post, from News From The Spirit World. Please enjoy Haunted Summer Reading Part One and look for Part Two at Newsfromthespiritworld.com soon. I was very excited to get this book and to start reading it. Then life happened. I absolutely hate for a book to take me longer than 2 weeks to read when I’m busy, but this book took me three weeks. For an earlier post about the Fox sisters from three weeks ago when I started the book, CLICK HERE. 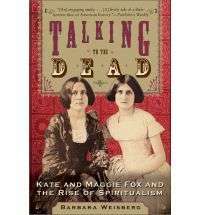 I think you’ll learn everything you ever wanted to know about Kate and Maggie Fox with this book, Talking to the Dead: Kate and Maggie Fox and the Rise of Spiritualism by Barbara Weisberg. If you read books on ghosts or paranormal investigation topics you know that most of these books include a small section that usually credits these two sisters for starting the movement known as Spiritualism on accident in the late 1840s. Usually when you read this section you get a little bit of the author’s personal opinion on whether or not the Fox sisters pulled off the biggest hoax ever. Before reading this book I knew that they admitted to being frauds but then later recanted, but it seemed to me as if most authors that mentioned the sisters believed there was at least an element of authentic spirit communication happening. The two younger sisters (Maggie and Kate) claimed to hear “rapping” and knocks in their home coming from what they eventually decided was the spirit of a murdered peddler from years before. They were one of the first to attempt to communicate with spirits with this system of rapping. They eventually developed a system of “yes” and “no” answers and even spelling out messages. People came from all over to see it and they were an overnight sensation! Throughout this book I kept thinking to myself… “So was it real or not? Just tell me!” As I read I started out with the feeling the author was pro-spiritualism and seemed to believe almost every detail. Then toward the end I was surprised to find the author seemed to actually be very skeptical and was only telling the story from documented history. Strangely though, there are a lot of holes in the records and history involving the Fox sisters… I mean it wasn’t THAT long ago. It seems that some people believe they were legit and some people don’t. I definitely learned they had some sketchy and unclear moments. In this book we learn a lot about Maggie and Kate’s parents and other siblings. Leah was a much older sister and was very influential in Maggie and Kate’s futures as mediums and speakers who travel around the world demonstrating their abilities. The book doesn’t always paint a nice picture of her. I had never heard of Leah. It seems to me that she is just as important in the story. I learned about their loves and relationships. Maggie went through a particularly rough time with a man who tried to change her (Elisha Kent Kane, the explorer). I despised this man more and more with every detail I learned. There were a lot of famous and influential people who supported, followed, or were clients of the Fox sisters. There is much history of the Spiritualism movement in general included in the book. These women had leadership roles and started a movement in the days that women weren’t really accepted as leaders and weren’t supposed to be influential and smart. There were times they were definitely in danger. These were some ballsy girls! In general, I had no idea that they were famous into adulthood and led the movement for such a long period of time. They were full-blown celebrities for a while. The book follows them till death and closes out with a summary of the Spiritualism movement since then. So what do I think now? I think there is definitely proof of spirit communication and we learned a LOT from the Spiritualism movement (Obviously… this is The Big Séance). I also think a lot of frauds came out of it… and maybe there is much to learn from that too. But I think this story has to have some element of truth to it. I fell in love with the Fox sisters in this book and I really want to believe that they weren’t complete frauds. If anyone has suggestions of any good reads on the Spiritualism movement in general, I’d love to read more! It’s the kind of scary movie that I just love, and unfortunately they’re never made anymore. There’s no gore, no overly intense computer generated imagery (a pet peeve of mine), just an incredibly pimped out and abandoned mansion in the late 1800s that is just as spooky as you would expect it to be. Hammer Film Productions, from the UK (The Curse of Frankenstein, Dracula, The Mummy), makes a comeback to produce this film. Their heyday was from the 1950s into the 70s. After seeing the trailer I knew I’d love this movie. But I had no idea that there were so many references to spiritualism, including a scene where Daniel Radcliffe’s character notices an add in a newspaper mentioning a spiritualist and séances. I knew then that I was meant to see this movie. I’ve been reading a book about Kate and Maggie Fox, the sisters who are widely credited for starting the whole Spiritualism movement from the 1850s to the late 1800s. I blogged about them recently. Anyway, this is all from roughly the same time period. There are several clips and trailers, but this one is my favorite. If you haven’t seen the film I think you should! This might be a DVD purchase for me! Alright, here we go… second post for The Big Séance. This evening as I lie in bed I’ll begin my next book. It is called TALKING TO THE DEAD: KATE AND MAGGIE FOX AND THE RISE OF SPIRITUALISM by Barbara Weisberg. 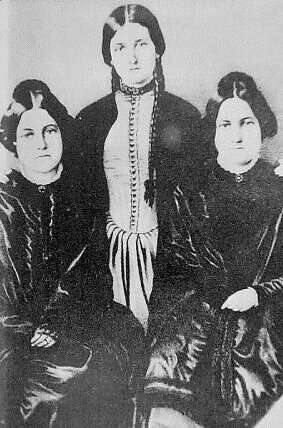 I’ve read many books on talking to the dead and several include and discuss the Fox sisters. This is the first book that I’ll read that is entirely focused on the sisters and the rise of spiritualism. Kate and Maggie Fox were young girls who are widely credited for really kicking off the movement of Spiritualism in the mid to late 1800s in New York state. They were one of the first to attempt to communicate with spirits with a system of “rapping” (knocking) on surfaces inside the home. They eventually developed a system of “yes” and “no” answers and even spelling out messages (even though it was time consuming and tired spirits out). People came from all over to witness it and they became famous for that time. Apparently they were caught red handed hoaxing at least some of their paranormal experiences as the years went by and they felt pressure to put on a show… but most Spiritualists believe that for the most part they were really communicating with the other side. All of this led to a period in time that I’ve always been a little obsessed with and would love to visit in a time machine (providing someone could guarantee I’d make it safely back to my iphone, DVR, Keurig brewer, etc.) 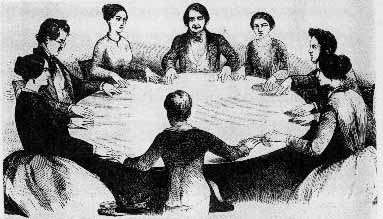 Home circles and séances began to be popular. People began looking within to realize they had some mediumistic abilities… and of course some faked it too. 🙂 And of course, ouija boards or talking boards (which I don’t promote) came from this period of time as well. It sounds SO exciting to me. Really, without even considering the fact that it is “2012” (which I have issues with… that’s another post), I think a lot of people believe that we’re experiencing another Spiritual movement right now… or at least a shift of some kind. People are becoming more intuitive and learning to choose love over fear or power. And… I believe people are becoming more and more open to the concept of there being no death… life continues. AND, there are only about eleventy-six paranormal or ghost shows of some kind on TV at all times. Then throw in the hundreds of paranormal investigation groups that are out there… and the number grows every day. 3. the belief that all reality is spiritual. 4. Metaphysics . any of various doctrines maintaining that the ultimate reality is spirit or mind. 5. spiritual quality or tendency. Anyway… I’ll have to let you know what I think when I’m done.